News and Inspiration from the UUA Stewardship and Development Office. The arrival of this new year, as always, was an important oppportunity to reflect, reconsider, repent, imagine, resolve, commit, begin again. The Rev. Kathleen McTigue offers some inspiring words for January 1st, or any ordinary day that calls us to reflection and action. The first of January is another day dawning, the sun rising as the sun always rises, the earth moving in its rhythms, with or without our calendars to name a certain day as the day of new beginning, separating the old from the new. So it is: everything is the same, bound into its history as we ourselves are bound. Yet also we stand at a threshold, the new year something truly new, still unformed, leaving a stunning power in our hands. We are bound into history and we stand on a threshold. More than ever, I am seeing Unitarian Universalists claim the stunning power in our hands and our feet and our hearts. I hear our leaders, lay and ordained, calling us to a deeper commitment to bringing our values into the world than we have yet dared to imagine. “Seasons of Giving” will share their stories, your stories. “Seasons” is an expression of gratitude for the generosity that brings our faith to life and an inspiration for the hard, heart-breaking, transformative work that is needed in our world. 2017 has just begun. It is ours to choose how we will help to shape it, how we will use our energy, our money, and our love to bend the arc of the moral universe. May we choose love and generosity. The massive, worldwide demonstrations that took place the day after the presidential inauguration showed how many share an urgent sense of concern about the new administration’s plans. The actions taken by the new administration within its first few days have made it clear that this concern is not misplaced. In these extraordinary times, we must be united in purpose to protect the values of our democracy and those vulnerable populations among us. To do so we must act, not alone, but together. 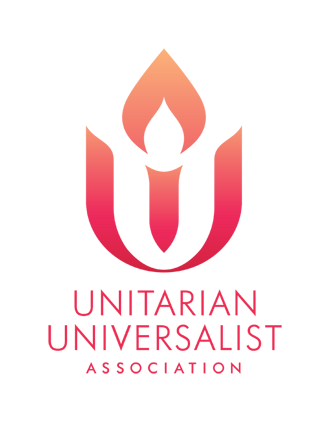 The Unitarian Universalist Association and the Unitarian Universalist Service Committee will coordinate their efforts to speak truth to power and act in support of basic human rights. Our first action is the Declaration of Conscience stating in the strongest possible terms our commitment in these troubling times. By signing this declaration, individuals and congregations will be affirming our core values and declaring our willingness to put them into action. This is not about partisan politics. It is a principled response to the potential targeting of people not for what they have done, but for who they are. Please read it, share it with your friends, family and congregation, and with your signature, join us in standing on the side of love, protecting the most vulnerable among us, and defending core values that are under attack. 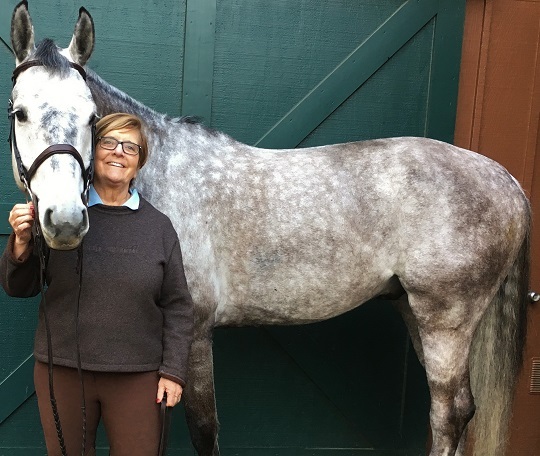 A longtime resident of Carmel, CA, Konny Murray grew up in the Midwest, where her generous parents “taught me I had a responsibility to share what I had.” Throughout her life she has found ways to share as a leader, a donor, and an inspiration. In 1999 she visited the Unitarian Universalist congregation and was surprised to discover she already knew twenty percent of the people there. She knew them because she worked with them to help make the community better through activism and volunteerism. This resonance of values sealed the deal for her. Since then, Konny has supported her congregation in many ways, again living the responsibility her parents had taught her. In Monterey County, Konny currently serves as president of both the Democratic Women of Monterey County and the SPCA of Monterey County. 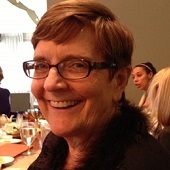 She has been devoted to supporting Planned Parenthood Mar Monte and the Women’s Fund of the Community Foundation. Many who champion progressive values have attended fundraisers at Konny’s home. Konny and her husband Dave love the beauty and opportunities of living in “heaven,” better known as Carmel, California. “Giving is a spiritual practice. She owns three horses (Bruiser, Dubby, and Bubbles) and can be found in the saddle at least three times a week. Konny also competes in duplicate bridge tournaments, and has two dogs that she and Dave adopted from the SPCA. The UU Church of the Monterey Peninsula is “enormously fortunate to have her as a member,” say Revs. Axel and Elaine Gehrmann. “Konny’s deep commitment to our faith, her generous and joyful spirit, her insightfulness and passion, her energy and enthusiasm are evident in her many volunteer activities that reach far beyond the walls of our church.” Konny serves as a Trustee and leader of the Stewardship Committee Chair at UUCMP. Konny has been supporting our UUA since 2008, and in 2016, the sale of a family-owned business gave her the opportunity to make a significant gift. She told us she finds inspiration in the words of Anne Frank who wrote, “No one has ever become poor from giving.” Thank you, Konny. We are so glad and grateful that Unitarian Universalism has become your spiritual home. The water we drink, the air we breathe, and the earth we share are all part of the interdependent web of existence: when one is threatened, we are all endangered. In North Dakota, the water supply at the Standing Rock Reservation is at risk from the construction of the North Dakota Access Pipeline (DAPL). As the Standing Rock Sioux tribe leads the effort to protect the water that nourishes them and the lands they hold sacred, Unitarian Universalists are among those standing with them in support. Many UUs joined the approximately 7,000 peaceful water protectors who camped on the cold North Dakota plains in late 2016, hoping to halt construction of the 1,170-mile oil pipeline from its planned route under the Missouri River, just half a mile from the reservation. 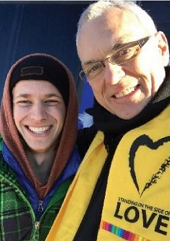 UUA President Peter Morales issued a statement opposing DAPL, calling it “a textbook case of marginalizing minority communities in the drive to increase fossil fuel supplies,” and participated in an interfaith gathering at the site in November. Local UU organizations also offered support to the indigenous activists leading the action. The 63-member Bismarck-Mandan UU Congregation transported donated supplies and hosted UUs who joined the water protectors from around the country. The Minnesota UU Social Justice Alliance (MUUSJA) coordinated caravans of UUs to the Interfaith Day of Prayer, and shared information showing non-indigenous people how to be helpful, respectful allies. Rev. 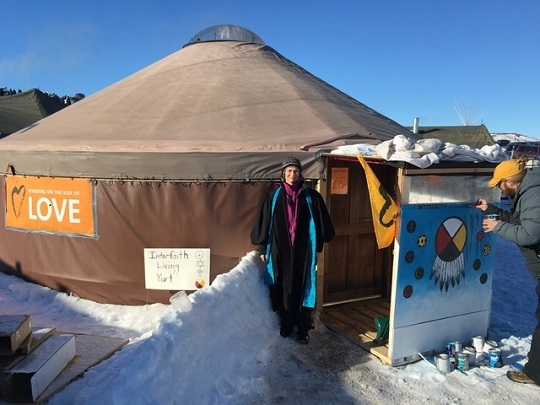 Karen Brammer at the Interfaith Living Yurt at Standing Rock. Rev. Harlan Limpert, Chief Operating Officer of the UUA, represented the UUA at the December 4, 2016 Interfaith Day of Prayer. “It was energetic, and there were people of every race, ethnicity, and gender present,” he said. The Army Corps of Engineers and the Governor had ordered an evacuation of the camps by December 5, but tension was transformed to joy when the Army Corps announced it would not permit the pipeline construction to continue its planned route. As the situation evolves, strategies and needs will change. Keep up with the latest news and find out how to help at the Standing Rock Sioux Facebook page, where you can also find background information on DAPL. Further details on UU activism for Standing Rock can be found at UU World. To learn about the impact of colonialism on indigenous people in the U.S., see the Doctrine of Discovery pages at UUA.org. Which UU hero inspires you to give? Subscribe to The UU Bulletin for announcements and updates from the various staff groups and committees of the UUA. The UUA Facebook page shares information and inspiration.